Satras Eastern Heights, located in Mumbai, is one of the residential developments of Satra Properties. It offers spacious 1 BHK, 1.5 BHK and 2 BHK apartments. The project is well equipped with all the amenities to facilitate the needs of the residents. Chembur has a number of renowned schools, hospitals, and banks are in the vicinity. There are a various MNCs and IT hubs are functioning here making it an attractive option for the working population. Mumbai's real estate market revolves around an equal rise in residential and commercial spaces there. Because of the surge in demand by NRIs, the call for the luxury segment has been on a rise here. In which area is Satras Eastern Heights located?The project is situated in Chembur, Mumbai Harbour. What are sizes of apartments in Satras Eastern Heights? The apartment sizes in the project range from 580.0 sqft to 890.0 sqft. What is size of 1 bhk in Satras Eastern Heights? The area of 1 BHK apartments ranges from 580.0 sqft to 751.0 sqft. How much is area of 2bhk in Satras Eastern Heights? 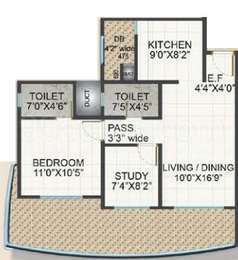 Two-room units (2BHK) in the project are available in an area of 890.0 sqft. How much is the actual area of Satras Eastern Heights?The area of the project is 4.66 Acres. How many units are there in Satras Eastern Heights?There are 461 units available in the project. Satra Group is a construction company based in Mumbai city. The builder has been building flats with 2BHK and 3BHK units that are well-ventilated. The team has been growing under the guidance of Mr. Praful Satra. Satra Group aims to achieve excellence and growth by creating world-class infrastructure. They have been building homes with the highest standard of professionalism, quality customer service. Some of the developed flats are Satra Mahavir Ville, Satra Juhu Residency, Satra Rehana Heights, Satra Harmony. A very good project. Strategically located for ease of access to other major business hubs and parts of Mumbai and Navi-Mumbai. By the time the project is complete, we can expect a good appreciation as well as good rental value.